Immeasurably important and altogether too rare to ever satisfy demand. 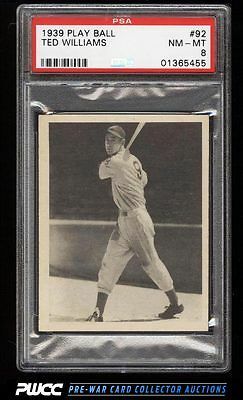 The '39 Williams RC represents one of the true rookie issues from the pre-war era and sits atop the short list of must own HOF rookie cards. Offered here is among the highest graded examples in the land, boasting four undeniably NM-MT corners, crisp edges, and great print for the issue. All told this is a wonderful investment piece and one of very few PSA 8s we've brokered in our history. One of nearly 20,000 cards, lots, and sets up for bid in our 7th Auction of 2016. Click on the link above to view the other PWCC auction lots.